After indulging in the those hard facts, you might want to ease up with something more light-hearted... read some trivia. You should also check out Karbon-Karbon's music — that's what's all about, after all. Should some questions still feel unanswered, you could always contact Karbon-Karbon. The term carbon-carbon composites (CCC) is used for a group of materials in which highly ordered graphite fibres are embedded in a matrix of carbon. The most striking feature of CCC is their capability to retain mechanical properties in many environments to temperatures in the range 2000-3000°C. The low thermal expansion of these materials makes them dimensionally stable over a wide range of temperatures. This feature is also very beneficial with regards to withstanding of thermal shocks. In addition, they represent a lightweight and high-strength material class. The structure of the material, and correspondingly its properties, may vary. The fibres embedded in the graphite matrix can either be oriented in a single layer or have a 3D architecture. One limiting factor for CCC is their tendency to oxidize at temperature between 600-700°C. Remedies for this exist, but they are costly. CCC are very expensive to manufacture, often requiring highly time consuming processes. This limits the range of applicability, leaving the materials a choice for the most demanding conditions, where few or no alternatives exist. Many of the "black areas" on the exterior of the space shuttle are carbon-carbon composites. Thanks to Dr. Erling Østby for this precise description of carbon-carbon. Lars Mikalsen plays guitar and programs synths - sometimes he plays guitar through one of his synth patch creations. Jørgen Thorstvedt sings, and more often that not on Karbon-Karbon's recordings; he sings more than one voice at a time. They both program drum beats, but once in a while they call upon their drum playing friends for assistance. Lars favours Fender Stratocaster guitars, but occasionally uses his Steinberger. He uses no real guitar effects or amplifiers, only software emulations. Jørgen sings into an Alesis microphone. He used to plug his mic into a tube pre-amp, but nowadays he favours one with temporal harmonic alignment. They both compose Karbon-Karbon's music, but seldom in each others company - a noteworthy expection is purle's chorus. Every Karbon-Karbon song features contributions from both Lars and Jørgen, but as time goes by they have difficulty identifying who contributed what. Lars uses heavy picks (2 mm) and light-top/heavy-bottom strings (.010-.052). His guitar's volume and tone controls are always on 10. Jørgen prefers to record his vocals with the microphone cord on the floor between his legs, and a pencil in his left hand. Nobody knows why, including himself. Karbon-Karbon offers harmonically complex and melodic alternative pop/rock on their self-titled debut EP. Karbon-Karbon are characterized by their at times untraditional chord movements and their sophisticated vocal harmonies, which put together results in a melancholic and thorough soundscape. The guitar work often utilizes unorthodox sound effects, and has an originality and technical precision in the solo parts that until now hasn't been associated with alternative pop/rock. In combination with a number of creative electronic aspects, the aforementioned elements constitute the Karbon-Karbon sound. The five tracks of the EP were composed under the slogan "must sound good on a beat-up acoustic guitar", but from this basis the songs have been orchestrated with fashionable digital synthesis - though with the purpose of recreating controllable "vintage warm" analogue sound. The result is a collection of melodically strong songs that in instrumentation and soundscape creates a synergy between hi-tech digital and analogue retro. Karbon-Karbon's members are Lars Mikalsen and Jørgen Thorstvedt. The songs were composed and produced in their entirety by Mikalsen and Thorstvedt in collaboration. They also played and programmed all parts on the EP themselves, though with prefigurative assistance from skilled percussionists on selected tracks. Ocean — a hovering intro transitions quickly to a synth based verse with semi-funky drums. The bridge and hard-hitting chorus is carried by catchy vocal lines that immediately stick to memory. Some sources allegedly claim this track summarizes the synth pop and hair metal of the 80's in one song – a claim Karbon-Karbon refrains from commenting upon. Purle — tribal drumming and dissonant guitar riffs define a suggestionizing foundation for the evolving vocal lines of the verse. The chorus is a symphony of multi-instrumental harmony lines, served on a bed of arch-typical Karbon-Karbon chord movements. Roses — Karbon-Karbon will probably never come this close to straight forward rock again – dense vocal lines just barely escapes getting drowned by slide guitars and primal chords of the feedback-generous kind. Pinicube — an express train of a track offering surprising details around every corner – including double-bass, a chorus in 15/8 time, spectral guitars, vocoders and mathematical drums on a ph.d. level. Dizzy — electronic pling-plong and an acoustic rhythm section are united in this gliding composition. Relaxing vocals and an inspiring cadenza concludes the EP in a dignifying manner. Karbon-Karbon leverer harmonisk kompleks og melodiøs alternativ pop/rock på denne selvtitulerte debut-EP’en. Karbon-Karbon kjennetegnes med de tidvis utradisjonelle akkordsammensetningene og de sofistikerte vokalharmoniene som sammen gir et melankolsk og gjennomarbeidet lydbilde. Gitararbeidet benytter tidvis uortodokse lydeffekter, og har en originalitet og tekniske presisjon i solopartiene som til nå ikke har vært forbundet med alternativ pop/rock. I kombinasjon med en rekke elektroniske momenter, utgjør overfornevnte elementer det karakteristiske Karbon-Karbon sound'et. Utgivelsens fem titler ble komponert under parolen ”må låte bra på kassegitar”, men har derfra blitt orkestrert med nymotens digitale syntese – dog med den hensikt å gjenskape kontrollerbar ”vintage” varm analog lyd. Resultatet er låter som står på egne ben, og som i instrumentering og lydbilde synergerer høymoderne digitalitet med analog retro. Karbon-Karbon’s besetning består av Lars Mikalsen og Jørgen Thorstvedt. Låtene er komponert og produsert i sin helhet av Mikalsen og Thorstvedt i fellesskap. De trakterer instrumenter og programmerer alt på denne EP’n selv, dog med forbilledlig assistanse fra drevne batterister på utvalgte spor. Ocean — en svevende intro bringes raskt over i et synth-basert vers med semi-funky trommer. Broen og det tungtslående refrenget bæres av catchy vokallinjer som sitter etter første gjennomhøring. Noen har påstått Ocean oppsummerer 80-tallets synthpop og hairmetal i en og samme låt - noe Karbon-Karbon forøvrig avstår fra å kommentere. Purle — tribal-trommer og dissonante gitar-riff definerer et suggererende rytmefundament for versets lange vokallinjer. Refrenget er en symfoni av flerinstrumentelle harmonilinjer, servert på en seng av erke-typiske Karbon-Karbon akkordprogresjoner. Roses — så nære streit rock vil nok Karbon-Karbon aldri komme igjen - tette vokallinjer overdøver såvidt slide-gitarer og feedback-spandable primal-akkorder. Pinicube — et ekspresstog av en låt med overraskende detaljer rundt hvert hjørne - inkludert kontrabass, refreng i 15/8-takt, spektral-gitarer, vocoder og matematiske trommer på doktorgradsnivå. Dizzy — elektronisk plingplong og akustisk rytmeseksjon forenes i denne svevende komposisjonen. Relakserende vokallinjer og en inspirerende kadens avslutter EP'en på en verdig måte. 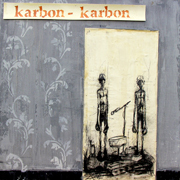 The Karbon-Karbon EP was released on Villa Records spring 2006, and features five original tracks written, performed and produced by Karbon-Karbon. Please respect that Karbon-Karbon only plays stadium-size concerts.